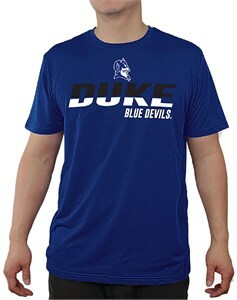 Show off your NCAA team pride on game day or anywhere you want in the Duke Blue Devils Men's Tracer Poly Short Sleeve T Shirt from E5 an Officially Licensed NCAA Supplier. Constructed from 100% Polyester Material that should give you seasons of wear this Standard fit shirt which gives you plenty of room for movement without a baggy look so you will always look in style. Made in Royal this Guys Tee features a front screened team graphic, short sleeves, a tagless collar, and a crew neck.